It's taken a rather conscious effort, but I've never watched anything of Tyler Perry's before. None of his movies, none of his 50 shows on TBS, and definitely nothing with Madea. Why? A host of reasons, really. I can't get over the fact that he slaps in name in front of absolutely everything he does. Think about how narcissistic someone like James Cameron is. Can you imagine if he started naming every movie like, "James Cameron's Titanic?" And yet, no one even batted an eye when Tyler Perry extended this trend to his TV shows! (Yes, shows. Plural. Sigh.) There are really only so many prominent black directors in Hollywood - couldn't he just trust the viewing public to know these productions are his? I don't think anyone is going to mix up his movies with Spike Lee's. Anyway... after holding out for a number of years, it's becoming clear that Tyler Perry isn't going anywhere. And with people out there continuing to give him their money, I figured I'd see what all the fuss was about. So I asked a friend and Tyler Perry fan (I really had to search to find one) to recommend the "best" Tyler Perry movie. This is the one she picked. Sigh. 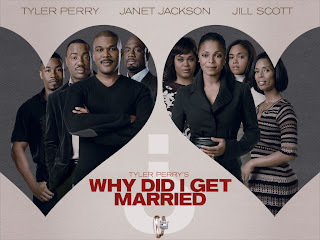 This movie simply reinforced my theory that Tyler Perry is an inflated-ego control freak. Because like everything else of his, he has the sole credit for writing, directing, and producing the movie. The problem with this is that the movie has 8 main characters. So when only one person is responsible for developing all these characters, they often become one-dimensional, which the 8 people in this movie are. Ensemble casts are difficult enough to pull off without the added pressure of making each person relatable in their own right. Besides the lack of depth in character development, there was also a lack of depth in casting. Some of the actors (like Tyler Perry himself), do a convincing job. Others, like fake Kerry Washington (aka Sharon Leal), do little more than exist on screen. And while some singers and other non-actors have successfully made the leap to the big screen, I would not count Jill Scott as one of them. She was supposed to be the most sympathetic character of the movie, but I was so distracted by her bad acting I didn't really care. And from the movie description for [Tyler Perry's] Why Did I Get Married Too (which I saved on my DVR in case I liked this movie), the entire sequel seems to center on her. Needless to say, I will not be making it a priority to watch it. All in all, the movie reminded me strongly of a chick-lit novel I read recently. It had a lot of the same individual story lines, a predictable ending, and an easy watchability/readability to it. Do I believe Tyler Perry is talented? Absolutely. But more in the way that Lady Gaga is talented in making herself stay relevant and popular despite having only marginal talent in singing and songwriting. Final word: This is an excerpt from an article I recently read: "If someone comes in and asks for a recommendation and you ask for the name of a book that they liked and they can't think of one, the person is not really a reader. Recommend Nicholas Sparks." Now substitute "movie" for "book" and "Tyler Perry" for "Nicholas Sparks."